Advocate Good Shepherd Hospital’s commitment to exemplary care for individuals with Atrial Fibrillation was recognized in August of 2015 when we received accreditation by the Society of Cardiac Patient Care as a certified Atrial Fibrillation Center. Atrial fibrillation (AF or AFib) is an irregular heart rhythm that occurs when the electrical impulses in the atrial chambers (or upper chambers, see upper right image) of the heart become unorganized and result in a rapid chaotic pattern (see lower right image). 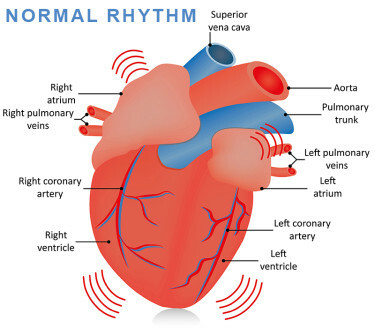 AFib results in decreased pumping of the upper chambers of the heart. This decreases the amount of blood the heart pumps out and also causes the blood in the heart to become stagnant and prone to clots. Clots may then travel out of the heart and up to the brain resulting in a stroke. There are over 2 million people in the United States currently living with Atrial Fibrillation and the incidence rate is projected to rise to over 5.6 million people by the year 2050. Stroke is the most dreaded consequence of Atrial Fibrillation. The risk of stroke resulting from A fib increases from 1.5% in those aged 50 to 59 and rises to 25% in those 80 years of age and older. Additionally, strokes caused by AFib are typically larger, more disabling and often fatal. Signs and symptoms of AFib may include palpitations, chest pain, and shortness of breath, dizziness, fatigue or possibly no symptoms at all. Discovery of AFib may also occur through detection of an irregular pulse. Advocate Good Shepherd Hospital’s commitment to exemplary care for individuals with Atrial Fibrillation was recognized in August of 2015 when we received accreditation by the Society of Cardiac Patient Care as a certified Atrial Fibrillation Center. Advocate Good Shepherd Hospital is the first hospital in Illinois to receive this certification. Increasing awareness for the risk of stroke, early detection of this irregular heart rhythm and appropriate anticoagulation all contribute to reduction in stroke risk and associated complications. Patient-centered, evidence-based care fosters superior outcomes with improved quality of life.